Experimenter demand effects refer to changes in behavior by experimental subjects due to cues about what constitutes appropriate behavior. We argue that they can either be social or purely cognitive, and that, when they may exist, it crucially matters how they relate to the true experimental objectives. 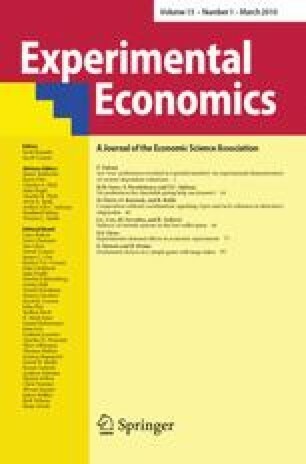 They are usually a potential problem only when they are positively correlated with the true experimental objectives’ predictions, and we identify techniques such as non-deceptive obfuscation to minimize this correlation. We discuss the persuasiveness or otherwise of defenses that can be used against demand effects criticisms when such correlation remains an issue. I wish to thank participants to a presentation at Bologna Forli’ and Piers Fleming, Nick Bardsley, Dan Benjamin, Pablo Branas-Garza, Tim Cason, Gary Charness, Andrew Colman, John Duffy, Dirk Engelmann, Paul Ferraro, Shaun Hargreaves Heap, Alexander Koch, Charlie Plott, Jen Shang and two anonymous referees for useful feedback and references on the topic. Partial financial support from the Nuffield Foundation (SGS/35859) is gratefully acknowledged. The usual disclaimer applies.